This semi-detached pair, Wayside Cottage and Newlands, was built by Thomas Arthur Leonard for himself and his sister. He was a pioneer of outdoor activity holidays for working people, pacifist and friend of early Labour Party politicians including prime minister Ramsay MacDonald. His influence on mass tourism has been likened to that of Thomas Cook and Billy Butlin, but the modest size of the house where he spent his last 13 years speaks volumes about his character. Mr Leonard was born in London in 1864. While a Congregational Church pastor in Lancashire, he took groups of holidaymakers to Cumbria. The Co-operative Holidays Association was formed in 1897, with Mr Leonard as general secretary, to provide “simple and strenuous recreative and educational holidays”. He left the CHA in 1912 to found the Holiday Fellowship. From 1914 he lived at the HF’s Bryn Corach holiday centre, based on the large stone house (overlooking a sloping field) which you can see if you walk a little further west up Sychnant Pass Road and look to your left. (Bryn Corach is next door to Conwy Youth Hostel.) 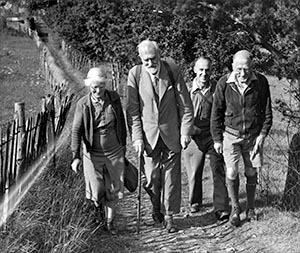 Among his visitors there were playwright George Bernard Shaw and many early members of the Labour Party, including Ramsay MacDonald. Those Labour figures shared his pacifist views, arousing suspicion when Labour Party meetings were held at Bryn Corach during the First World War. “More than once, armed men came up and charged us with showing Morse signals from our windows, but left satisfied that it was only a case of ‘walloping window blinds’,” Mr Leonard later recalled. Other early HF centres were Newlands, in Cumbria, and Kelkheim, in Germany. One of the HF’s aims was fostering international friendship. Mr Leonard helped introduce Britain to the European practice of youth hostelling and was a founding vice-president of the British Youth Hostels Association in 1930. Two years later, he donated a house he’d received as a retirement present to the YHA to form one of Britain’s first youth hostels. He was the Ramblers’ Association’s first president and supported the formation of the National Trust and Campaign for National Parks. He lived at Wayside from 1935 until his death there in 1948. The house had been designed in Arts & Crafts style and probably built c.1927. An internal door allowed him to visit his widowed sister Emma Ballard in Newlands next door, or vice versa. The photo above shows him at what was then the common front gate for both properties. 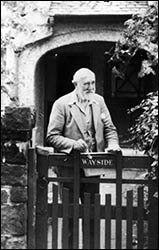 The lower photo, also courtesy of the Nancy Green Collection, depicts him walking on the footpath below Bryn Corach aged 83. Mr Leonard’s last tourism initiative was the Family Holidays Association, founded after the Second World War to convert former military training camps into family holiday parks, including the one at the Morfa area of Conwy.